Something that caught my eye on the Digital Urban blog was a reference to a fantastic little website applet that shows Flickr slideshows with a difference. Called Flickrvision, it shows a near-realtime view of images being uploaded to the Flickr online album website, overlaid on a map of the world. 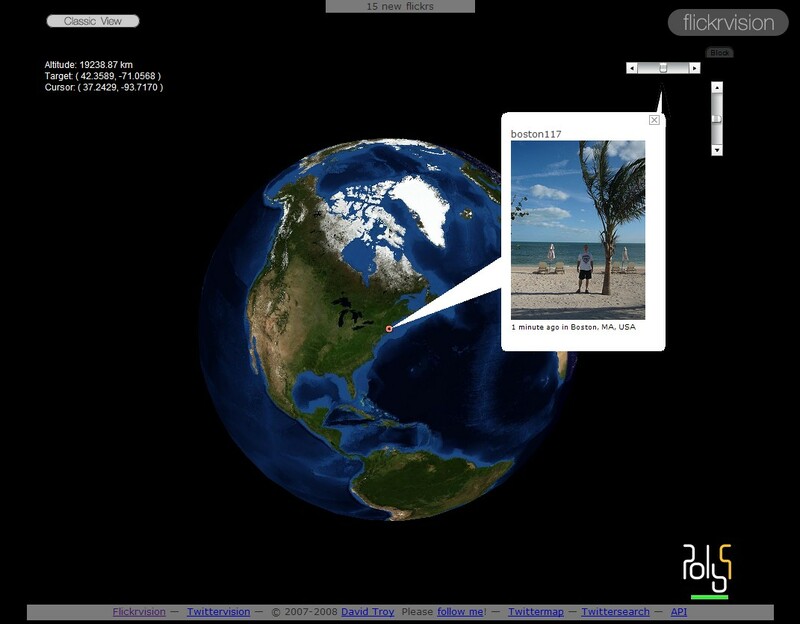 You can overlay the pictures either on a normal 2D Googlemap or, as the screenshot here shows, onto a 3D view of the Earth which spins around to help position the images. You can go straight to the 3D version by clicking this link. There’s no need to install anything – just click & go. To switch to the Googlemap version, just press the “Classic View” button that appears on the screen. It is a great page to just leave open on your desktop, especially if like me you have a two screen set-up. A quick follow up on the post a couple of months ago about my quest to find a simple way of embedding Google Maps in WordPress blogs. Just to recap, the main issue I had was finding a way of embedding custom maps. While I still have yet to find a solution to self-hosted WordPress blogs like this one, there is a good solution for anyone who has a blog hosted at WordPress.com. For those of you that don’t know, this is a site that looks after thousands of WordPress blogs for free. They run their own specific version of WordPress – you can’t get at the PHP code or install your own plugins. But it’s a great way to host sites at little or no cost. I run a couple of community sites hosted there, both for the Round Table organisation – see Long Eaton Round Table and also the Area 14 sites. That version of WordPress provides a tag – “googlemap” – that can take any Google Map reference including custom maps and embed them in the page properly. It works really well – for an example, see the About page on my Area 14 site. Instructions for using the tags can be found here. Now all we need is the same thing on the regular version of WordPress, and I’ll be a happy bloke.